This is the blog for Toronto, Canada-based children's publisher Napoleon Publishing. The company has been producing award-winning materials since 1990. On June 22nd, Peggy Dymond Leavey was one of three authors who read at Children's Day, day two of the County of Prince Edward Authors' Festival. The event was held upstairs in the bright new loft space over Books and Company in Picton. After a break of four years, the festival hopes to become a yearly event once again. 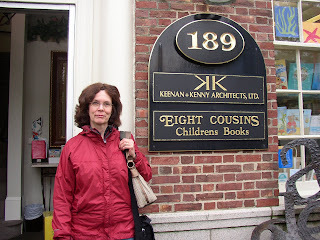 Brenda Chapman visited numerous bookstores on a roadtrip across New England. 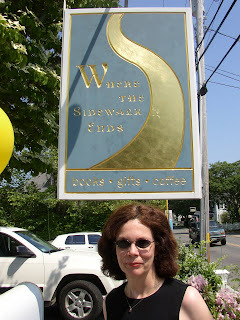 She is pictured in front of Eight Cousins bookstore in Falmouth (Cape Cod) and in front of Where the Sidewalk Ends bookstore in Chatham (Cape Cod). After a four year hiatus, The Prince Edward County Authors' Festival is on again. It will be held June 21st & 22nd at Books & Company, 289 Main St, Picton. Children's Day is Sunday, June 22nd from 1 to 3 p.m. One of the presenters is Peggy Dymond Leavey, who will be reading from her latest novel, "Treasure at Turtle Lake". There is no charge for Children's Day Readings. It is sponsored by the County of Prince Edward Public Library. Heather Kirk, author of Warsaw Spring and A Drop of Rain, two linked teen novels published by Napoleon, spent Monday June 2, 2008 talking about her books at the Royal Victoria Hospital in Barrie. Heather and five other writers from Simcoe County set up displays of their books in the cafeteria of the hospital and chatted with hospital staff and visitors. Heather, who is also the author of a recent biography for teens and adults about world-famous Canadian writer, Mazo de la Roche, gave three talks on de la Roche over the past six weeks. Heather spoke to the Simcoe County Historical Association on March 18, the Orillia Historical Society on May 21, and to the Stroud Book Club at the Innisfil Public Library on May 28. On April 12, 2008, the Historical Sites and Monuments Board of Canada unveiled a plaque to Mazo de la Roche at Benares Historic House in Mississauga, Ontario. De la Roche (1879-1961), author of the Jalna novels, is now officially a "person of national significance." De la Roche was born in Newmarket, Ontario, and grew up mainly in Newmarket, Orillia, and Toronto. 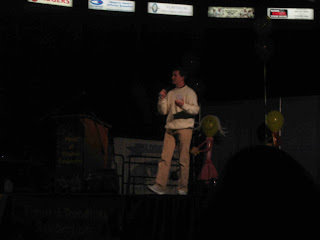 Christopher Dinsdale was invited to the Hershey Centre in Mississauga for the final event in this year's Festival of Reading celebrations. It was an energetic afternoon with cheerleaders, rappers and dancers showing their stuff between author presentations. Fellow Napoleon author Peggy Dymond Leavey was also part of the festivities as highlights from last year's celebration were presented on the big screen. It was an exciting end to an amazing festival. Thank you OLA! Napoleon & Company is a book publisher based in Toronto, Ontario, Canada. We are Canada's leading publisher of crime and mystery fiction, as well as children's books, literary fiction and music books. 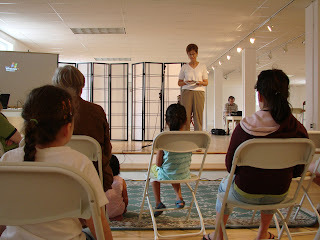 This blog will feature news and events about our authors' activities.